Friends and followers! 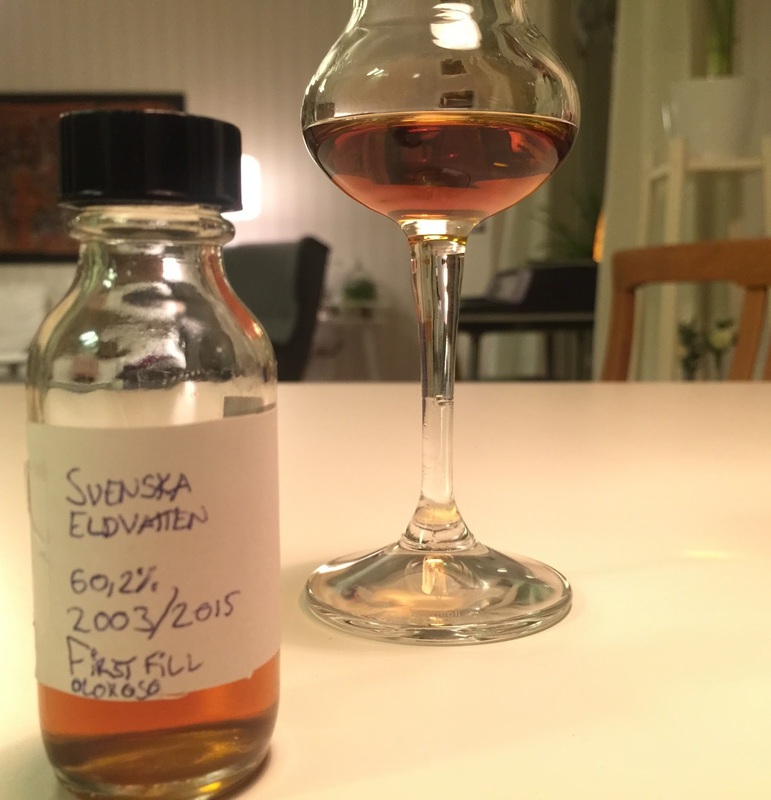 As promised in my last post, I now bring you a tasting note of the second bottling in the anniversary-series celebrating the first five years of Svenska Eldvatten (”Swedish Firewater”) as independent bottlers! 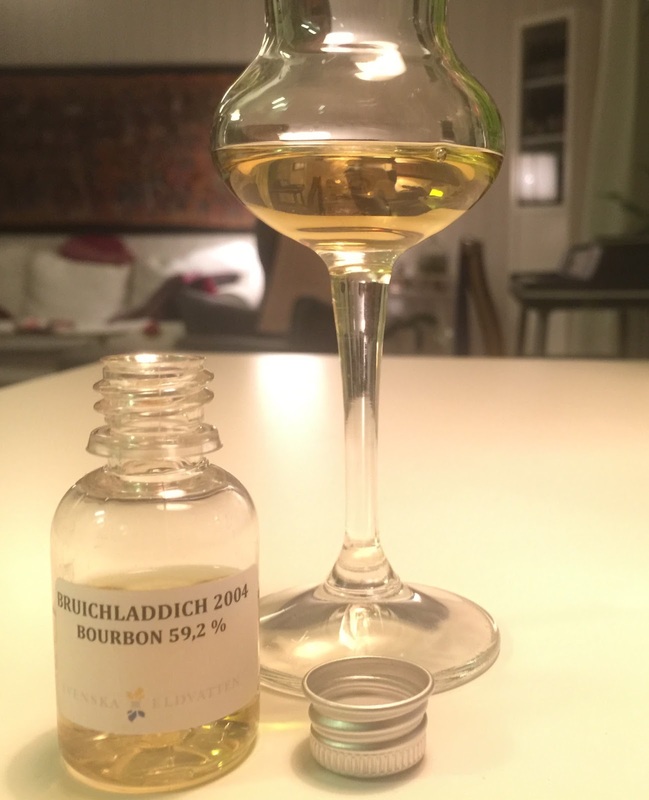 This particular whisky was distilled at Bruichladdich Distillery in november 2004. It was put into barrel no.1407, a fresh Ex-Bourbon Barrel (that is to say first-fill) and then bottled in november 2015 (11 years old) resulting in 102 bottles at 59,2 % ABV. Peter and Tommy will bring this whisky (and the oloroso matured Laddie) to the Linköping whisky festival this weekend! It will be released at the swedish state monopoly and you will pick it up if you have 1295kr (circa 140 euros) in your wallet, or on your card ;) Ok, let’s have a taste! At first holding the glass on a distance of say 15 centimetres from my nose, I pick up some very exotic fruits, more precisely slightly immature pineapple, yellow kiwi and pealed non-ripe slices of pear together with some carbonated elderflower soft drink. Also something a tad ”sweet and/or sour” mixed up with something creamy (dairy), together reminding me almost of a brie that’s been out of the fridge for a couple of hours… Moving closer to the glass I pick up loads and loads of nutty-ness (yes of course I mean marzipan/almond paste). The creamy-/dairy-ness also reflects itself through something like white chocolate mousse. A very distant peaty-ness is also traceable, or maybe more moving on into a faded fire/ashy-ness? Trying to dig into that layer of scents I also pick up a slight touch of ground coffee and, wait for it, mint that strangely enough (given the age) mixed with raw-spirit. Ok fellas, a very complex and special nose on this one indeed, let’s have a taste! Oh wow! Lots and lots more peat on the palate than on the nose! Not really the ashy kind of peat that was on the nose but actually classic and very straight forward peat. Quite a medium-sweet centre in this dram, moving very much towards the pear and the brie from the nose. Then quickly moving on into a distinct woody-/cask-y-ness with lots and lots of the almond paste from the nose mixed up with something like herbal vanilla… sounds strange but tastes really good, and exciting if you know what I mean (?) In the aftertaste some lemonzest reveals itself in a very direct way, moving on into some bubbly-ness or a carbonated feeling. All in all a very creamy and nicely peated dram, I’ve never really tasted anything like it! Big thanks to Peter and Tommy for the oppurtunity! Please follow SamuelWhisky on my Zuckerberg-page by going here and my bird-page by going here. Copyright © and All Rights Reserved on all tasting notes by SamuelWhisky and pictures likewise belong to SamuelWhisky unless stated. If you would like to use any such material that belongs to SamuelWhisky or associated with SamuelWhisky, please ask by sending me an email to samuelkarlssonorebro(at)gmail.com Sláinte! Friends and followers! 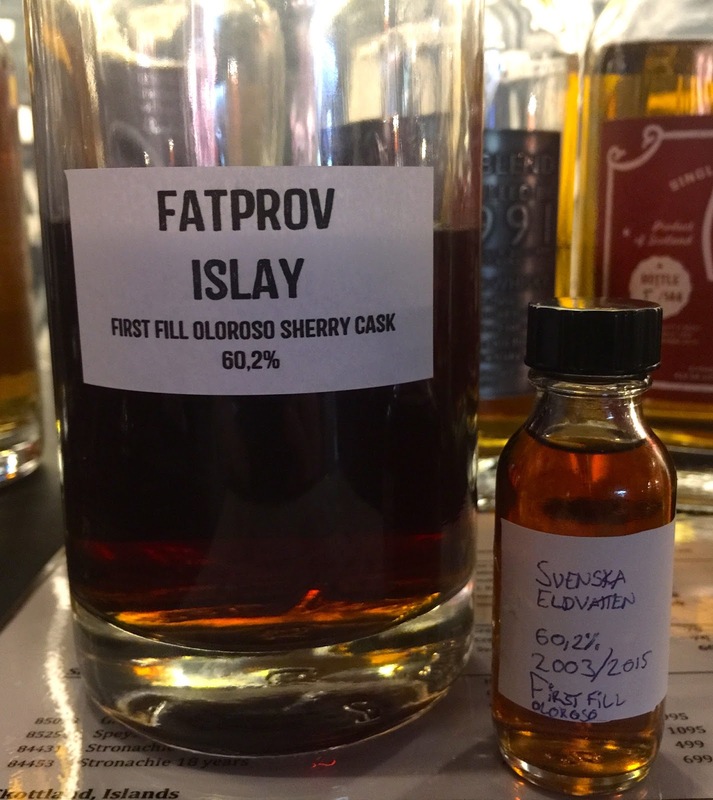 When working at the Örebro Beer & Whiskyfestival this november, I stopped by Peter and Tommy of the swedish independent bottler Svenska Eldvatten (”Swedish Firewater”) to see if they had any interesting news, and of course they did! Enthusiastically they shared info on their coming anniversary-series for this year, consisting of a number of bottlings celebrating their first five years as independent bottlers! 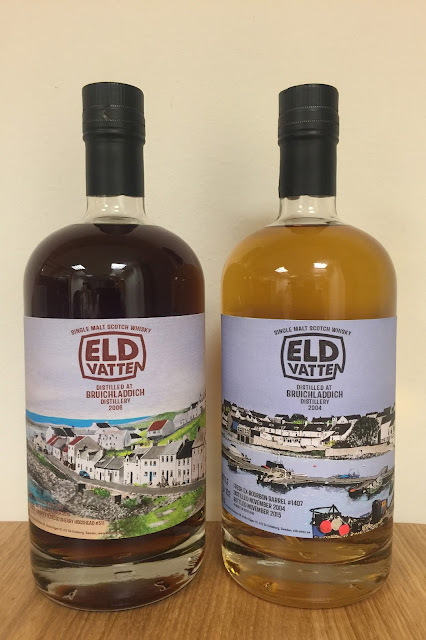 Every release in the series (as you can see from the picture to the left) has a very special and exclusive label showing a motif painted by the well-known artist/painter Petri Jäseperi (well-known in the world of whisky that is). Please note that every bottling in this series will have it’s individual motif. The whisky that I ended up obtaining a sample from was single sherry hogshead no. 511 (first fill oloroso matured) Bruichladdich, 9yo. It was distilled in june 2006 and bottled in november 2015. Bottled at cask strength 60,2% ABV the hogshead gave 285 bottles. Sounds great right?! This particular whisky will have it’s premiere release at the Viking Line Cruise Whisky Festival starting tomorrow and lasting this weekend. According to the pricelist it will cost 879kr (around 90 euros). On the 1st of february it will be released at the swedish state monopoly. To the festival they will also bring an 11yo single bourbon cask Bruichladdich from 2004 (seen at the bottom of this post), that will also be available on the swedish state monopoly on the 1st of february. I am very lucky to be able to review also that release in a week or so, so please stay tuned! Now, enough talking, let’s have a go at the sherrymatured one! Very, very dark sherrynotes! On the nose this one reminds me a lot of something like a mix of heavily sherrymatured Macallan and heavily sherrymatured Clynelish. The sherrynotes in this dram are very raisin-y, also very dried dates-y, and something like milchocolate with touches of oranges. In fact the sherry stuff is so heavy that I can barely get through it all! Trying really hard, I find some almond paste thats been absolutely soaked in oloroso, some heavy port wine and some definitely overripe pear, there is even a touch of cucumber water in there! (I’ve never nosed that before in a whisky…). There is also some very dark vanilla notes, not at all like vanilla fudge but rather something like vanilla pods simmering on the stove in whole fat cream, or like old style vanilla ice-cream, mmm… Well what about the peat? Isn’t this an Islay? People, the peat is very hard to pin down in this one! I do however find a slight, slight, slight touch of peat but it’s all mixed up with something quite citric. Well what about the strength? Isn’t it too strong on the nose? People, it doesn’t even strike me as being strong, feels like 50% ABV at the most. Anyways, summing up the nose, if you like sherry monsters, you will absolutely love nosing this whisky! Let’s see what’s on the palate! If you like heavily sherrymatured drams with just a touch of peat, you should definitely not miss this one! When it comes to the sherry influence versus the level of peat, I’d say that the sherry definietely dominates the peat. The only thing that comes to mind for a comparison is something like Bowmore Devils Cask but of course with very little peat. 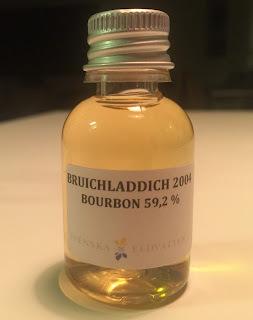 If I compare this release to previous heavlily sherrymatured releases from Svenska Eldvatten, say something like the Clynelish 1996 which I find to be way up there, I would rate this release as even better than that! 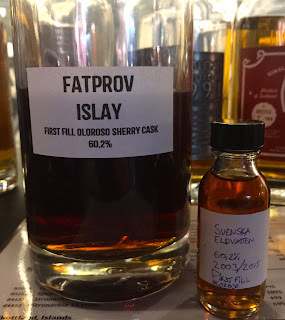 So, big thanks and Sláinte to the guys at Svenska Eldvatten for a truly great dram!